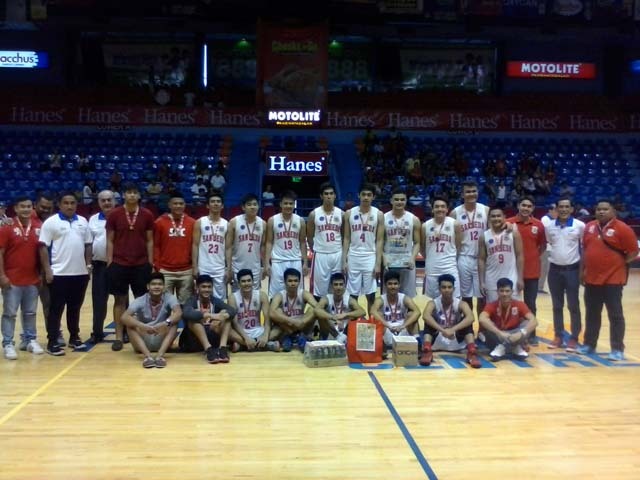 San Beda FilOil 2016 Juniors Champs | Servinio's Sports Etc. San Beda-Rizal Red Cubs: 2016 FilOil Flying V Premier Cup Juniors Champions. SAN JUAN City – San Beda College-Rizal captured the Juniors Division championship after holding off the challenge of Adamson University, 84-76, at the 2016 FilOil Flying V Premier Cup Sunday morning (June 12) at the San Juan Arena. Freego Most Valuable Player Samuel Abuhijle barrelled and bulldozed his way through the opposition as he led the Red Cubs’ strong fourth period assault. The wards of Coach JB Sison scored the first nine points of the fourth period capped by back-to-back triples from Abuhijle and Evan Nelle that gave San Beda the lead for good, 61-56. Unfazed, the Baby Falcons fought back as Evan Agbong tried to close the gap via the free throw line, threatening for the last time with 1:24 to go, 74-76. Abuhijle then completed his MVP performance with two more free throws to give the Red Cubs breathing space at the 53-second mark, 78-74. They then put up a crucial defensive stop with Prince Etrata and Nelle sealing the victory from the charity stripe. Prince Etrata had 16 points in the first half alone as the Red Cubs raced to a 40-27 advantage. The Baby Falcons then outscored the Red Cubs in the third period, 29-12, behind the 12 points of Jason Celis and eight from Jojo Antiporda as they overturned their 13-point halftime deficit to lead at the start of the final canto, 56-52. Etrata went on to finish with 24 points to go with six rebounds and five assists. Abuhijleh had a double-double of 15 points and 11 rebounds while Nelle also had 15 points. Joining Abuhijle in the Gatorade Mythical Five were Agbong, Kenji Roman of Far Eastern-Diliman and the Nazareth School duo of John Lloyd Clemente and Rhayyan Amsali. Roman also took home the Gatorade Defensive Player citation. Antiporda paced the Baby Falcons with 18 points. Celis followed with 17 and Gerry Abadiano chipped in 16. San Beda defeated Adamson in the elimination phase, 71-65, last June 3. Overall, the Red Cubs ended the tournament with a 5-1 win-loss record, their only setback coming in their first game against Lyceum-Cavite, 78-81, last May 6. Earlier in the day, Nazareth School salvaged Third Place by routing Far Eastern-Diliman, 86-67. NAZARETH-NU (86) – Atienza 13, Clemente 8, Sarip 8, Sangco 8, Penano 6, Tolentino 6, Mosqueda 6, Manalang 6, Coyuca 6, Amsali 4, Beldua 3, Callejo 3, Careng 3, Fortea 2, Malonzo 2, Javillonar 2, Jugar 0. FAR EASTERN-DILIMAN (67) – Abarrientos 15, Celzo 13, Bieren 8, Roman 8, Ro Alforque 8, Villareal 6, Boc 4, Re Alforque 4, Baclay 1. Period Scores: 29-12, 41-30, 65-47, 86-67. SAN BEDA-RIZAL (84) – Etrata 24, Nelle 15, Abuhijleh 15, Tagala 9, Obenza 8, Lagumen 6, Mahinay 3, Nayve 2, Velasquez 2. ADAMSON (76) – Antiporda 18, Celis 17, Abadiano 16, Natividad 8, Agbong 7, Sabandal 5, Desoyo 3, Umayao 2, Tamayo Sumoda 0, Asuncion 0. Period Scores: 19-14, 40-27, 52-56, 84-76. This entry was posted in Basketball, NCAA, Sports, UAAP. Bookmark the permalink.